Selling technology and professional services is a complex sale that requires specific strategies, techniques and action steps designed for our industry to get managers and C-level executives to buy. The methods and tactics taught in this book are designed only for IT salespeople and have been taught to and used by thousands of account managers worldwide. 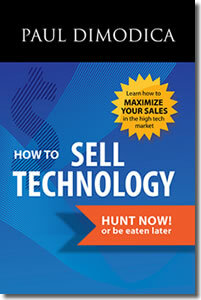 Selling technology is a contact sport, so if you have been selling for longer than one year, you have been bruised. Yet, if you sell correctly, you can escape the pain and maximize your success. So sit back, get comfortable, and let’s rumble through the technology sales jungle. In IT sales, you must Hunt now, or be eaten later!